South Africa will have to box clever when it comes to the management of the team. 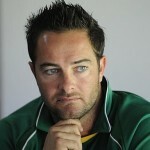 What former Proteas wicketkeeper Mark Boucher had to say on SuperSport about the fourth ODI defeat in Melbourne. Former Proteas wicketkeeper Mark Boucher and England batsman Kevin Pietersen took to Twitter on Tuesday to criticise the plan to introduce day/night Tests to cricket. I have had my say in SA Cricket magazine about on-field sledging, and now I want to cover the off-field banter. There was a lot of big talk during the Test series against Australia, mostly by Graeme Smith and Michael Clarke.